Sinéad D’Arcy, Head of Jameson International Graduate Programme pictured with the 2018 Jameson International Graduate Programme intake. 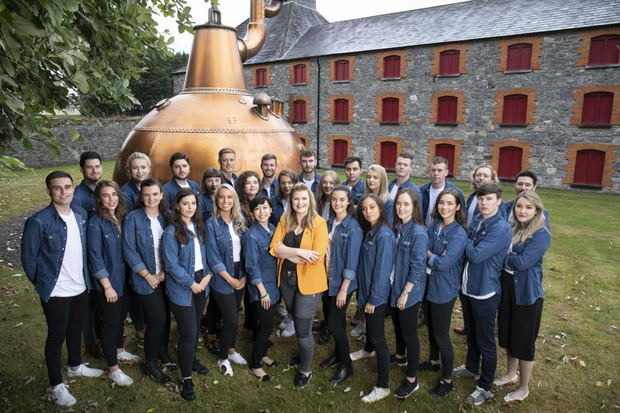 Jameson are calling for graduates "with serious character" to become international brand ambassadors for the firm over a three year period. The programme, which is split into two placements abroad, involves the graduate acting as an advocate for the Irish brand within local markets. Since it was established in 1991, over 400 graduates have completed the Jameson International Graduate Programme, gaining experience in areas including marketing, sales, digital and event management. A marketing or business background is not essential for graduates applying to the programme and four weeks induction training is given prior to the international rotatation. Head of the programme Sinéad D’Arcy said that it has evolved over the past number of years "to meet the changing needs and expectations of graduates in an increasingly competitive jobs market". "Every year we look for driven, charismatic and creative graduates, from a range of diverse backgrounds, to serve as brand ambassadors in cities across the world," she said. "The programme provides graduates with the resources to establish the brand in a seed market or accelerate the brands growth in an established one, while building professional confidence and competence." Ms D'Arcy said that the group is looking for graduates with "serious character" to apply. Applications for the 2019/20 Jameson International Graduate Programme close on Wednesday January 16 at 1pm.